Berries, apricots, peaches, cherries…they’ve all had their share of the spotlight during the summer months. Now it’s time for the plum to shine, the fruit with the sweet flesh and tart skin. I used to love eating plums when they were really ripe, where the flesh was soft, the juices dripped down your hands when you took a bite into it and the flesh stained red from the dark pigment of the skin. Nowadays, I like to enjoy the fruit in its cooked form. Sometimes I just crave a quick sweet-fix, and that causes a problem when there are no cookies or cake lying around the house. Thus, it’s always a good idea to have a backup recipe that you can turn to in order to throw a few ingredients together for an instant dessert. A great way to make use of fresh summer fruits is to bake them in a pie, a tart or the much simpler crisp (also known as a crumble). What I love about the crisp is that, while it is very much like a pie, you don’t have to labour over the crust. The crunchy topping is simply a mix of flour, sugar, butter and any additional additives according to your own personal taste. 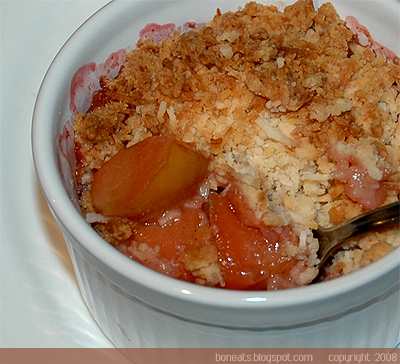 I love the texture contrast you get in the end from a crisp: the warm, softened fruits with the crispy, crunchy topping. I love playing around with the textual components of the crisp topping. Sometimes I’ll use rolled oats, granola, cereal, nuts or dried fruits. 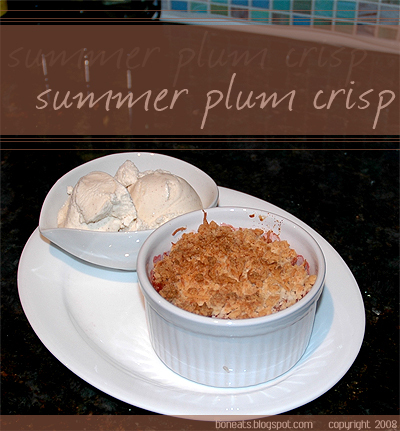 For this crisp, I threw in some shredded coconut, which also adds a beautiful tropical scent and flavour to the plum crisp. A crisp is such a warm, homey, comforting dish. Throw your ingredients together in a bowl and toss; spoon it into ovenproof bowls or dishes, and bake! This version is a bit tarter than others; serve it with some vanilla ice cream or sweetened whipped cream and it's perfect! Otherwise, you can always increase the amount of sugar to your taste. Place the flour, coconut and sugar in a bowl and mix to combine. Add the butter and use your fingertips or a fork to rub it into the flour mixture. Set aside. Place the plums, brown sugar and cinnamon and toss to combine. Spoon into two or three 1-cup capacity ovenproof dishes (ramekins are great!). Top with crisp topping and bake for 30 minutes or until golden. Serve with vanilla ice cream or whipped cream. Posted by Bonita at 3:10 p.m.
Vincent Fruci August 31, 2008 at 9:43 p.m.
Bonita-- this looks delicious! Congratualtions on this beautiful blog-- I hope one day to have a cosmic gastronomic experience in your award-winning restaurants.